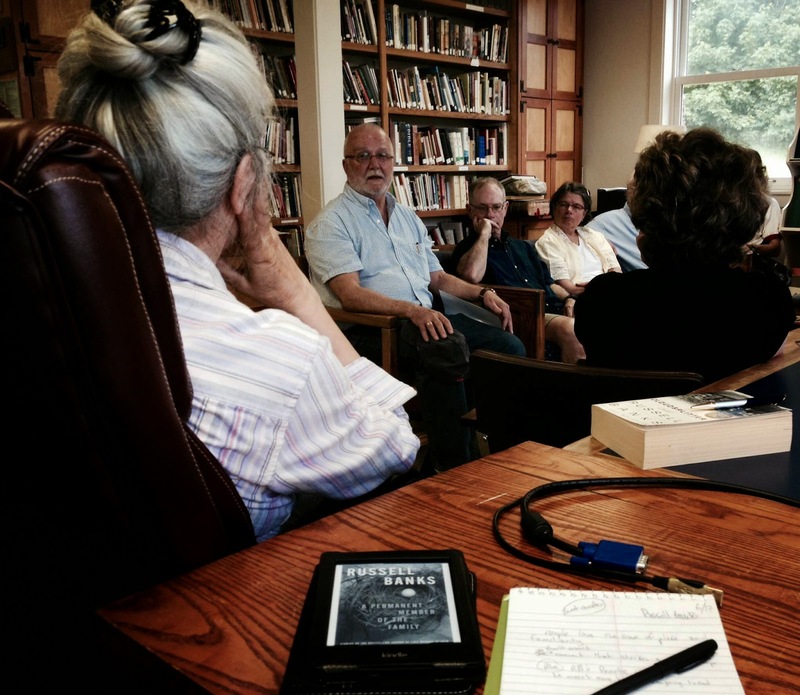 I got a chance to go and see Russell Banks meet with a local book-club to talk about his collection of short stories, "A Permanent Member of the Family" ... it was a fun and interesting and educational hour and a half. He talked about the stories in the book, living and writing in (and being inspired by) the Adirondacks, and reading and writing over the course of his life. The stories in this collection were inspired by events both in his life and that he heard/read about in the news; "These stories were built around a moment that struck a chord," is how he put it. Banks spoke about the difference in writing novels versus short stories ... he says that when writing a short story, he knows the beginning (and is often surprised by how they end), while with a novel he knows the ending (and has to feel his way through the opening to move the story in the direction that he envisions). He talked about his literary influences, which include both authors whose work and/or lifestyles he admired. He recalled his years of teaching writing (which he felt mainly, honestly, produced higher quality readers and audiences for writers rather than many writers). We spoke for a few minutes at the end of the book-club meeting. I attended a reading of his three years ago at the Paul Smiths VIC, when I had just finished the first draft of my first novel, "Here Be Monsters", and spoke with him for a minute about my fears/worries about publishing my book. He asked if I'd finished it yet, and was surprised when I mentioned having published a second novel ("Caretakers")as well as a few other shorter works. Part of the difference in productivity levels between us may be that he writes lengthier, and heavily researched, historical fictions, as opposed to my mysteries ... also, he writes in longhand with a fountain pen, while I type and edit on a computer. "Promises to Keep" goes live on Amazon!